Growing up in Pondicherry, India, Piscine Molitor Patel - known as Pi - has a rich life. 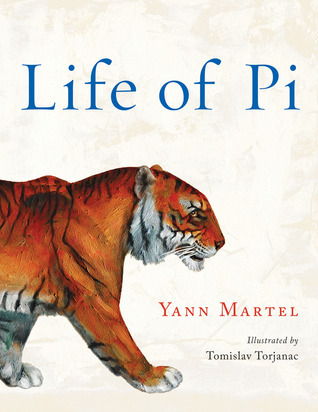 Bookish by nature, young Pi acquires a broad knowledge of not only the great religious texts but of all literature, and has a great curiosity about how the world works. His family runs the local zoo, and he spends many of his days among goats, hippos, swans, and bears, developing his own theories about the nature of animals and how human nature conforms to it. Pi’s family life is quite happy, even though his brother picks on him and his parents aren’t quite sure how to accept his decision to simultaneously embrace and practise three religions - Christianity, Hinduism, and Islam. A beautiful and remarkable story of faith and endurance. Provided with meticulous detail, this book pushes it's readers to the depths of human conviction and explores the journey for the will to live. I found this story sensational with it’s wonderful descriptions and meticulous research on even the smallest detail. Whether discussing zoological history, or a daily routine, Yann Martel makes us feel like we’re thrashing right along with Piscine, his misfortunate and what led up to his building beliefs. A seed was planted with Piscine and his investigative and curious mind in different religions and how, not only can they relate to one another and dwindle down to one central factor, but also how the elements of each religion benefit the soul in a variety of ways. Zoomorphism. It is foreshadowed (page 110,) and yet when we experience this trait with Pi Patel, it’s still incredible. Faith wasn’t the only factor in this plot, Pi’s education and experience with zoo’s and animals provided him with the patient skill of dealing with the animals on his boat, as well as the mysterious island he encounters. In essence, Faith provided him with the will to survive, while knowledge provided him with the tools. Offhand, I understand (for it is mentioned in the story; page 381) that the author needs the story to last 100 chapters, but some parts seemed unnecessary. I’m not just talking about the 1-2 sentence chapters, but also some of the deeply researched and extreme detailed parts of chapters. At times it made it difficult to focus and made me want to skim through parts of the chapter. This is the only main drawback I had with the novel. This being the illustrated version of the book, I can’t continue on with the review without stating how extraordinarily beautiful the illustrations were. I would buy and re-read the book again for the illustrations alone. Tomislav Torjanac is truly a master, his art in bright bold colors, depicts the scenes with perfection. I’m now a huge fan of his! In all this story has the ability to lift spirits when you think about all one can endure in a span of seven months. Seven months. A divine number, seven is.